Voki is an online tool designed to facilitate the virtual communication between a teacher and his or her students. Step 1: Go to www.voki.com. Step 2: Click the Register button. Step 3:Type in your name, email, and a password for your Voki account. Step 5: Press the Sign Up Button. Step 1: Log in to your email. 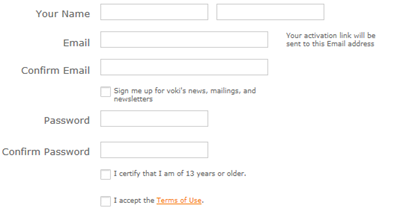 Step 2: Open the email from Voki. Step 3: Click the provided link to activate your account.